Prague Weather in 2018: What's the Best Time to Visit? Prague Weather in 2018: What’s the Best Time to Visit? The Czech Republic’s capital has a lot to offer its visitors throughout the year, but every season, of course, has its specifics. And when you plan your trip to Prague, it is important to know what weather you can expect in each month and what main events you can look forward to. The average monthly temperatures in Prague during the year are shown in the charts below, both in Celsius and Fahrenheit. The seasons in Prague are extreme; you can basically experience very cold winters with snow but also extremely hot summers with lots of sunshine. 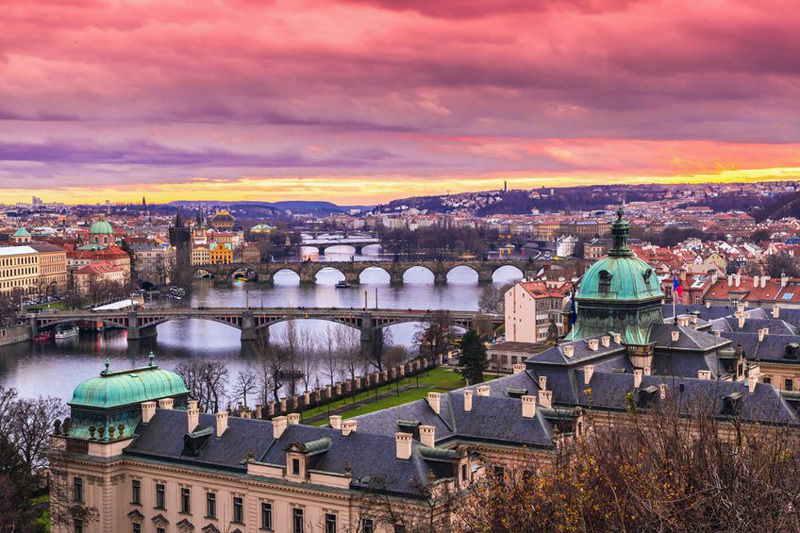 From a tourist’s point of view, Prague is especially popular in December, thanks to the Christmas Markets, and in May/June when the weather is very pleasant. Prague flourishes in spring. This begins in the second half of March when temperatures rise above freezing, the snow starts to melt, and the first flowers appear. At the beginning of March, temperatures can still sometimes drop a bit below freezing. April in the Czech Republic is quite unpredictable and can change from sunny to snowy in a matter of minutes. It can also get windy and temperatures can vary quite a bit. Finally, in May the weather becomes quite consistently sunny and warm, with average temperatures at 15 – 25°C (60 – 77°F) during the day. Main events in spring include St. Patrick’s Day in March, the Easter Markets in April, and Czech Valentine’s Day in May. Lately, summer has been getting warmer and warmer in the Czech Republic’s capital, and you have a high chance of enjoying some very sunny and even tropical days during Prague’s holiday season. The average temperatures are 16°C (61°F) in June, 17°C (63°F) in July and 18.5°C (65°F) in August. These numbers of course only describe the average temperatures, the highs (during the day) are usually much higher and often exceed 25°C (77°F). Prague’s main attractions in summer are long downtown walks, cruising on a boat, and many open-air festivals. Autumn in Prague is very beautiful and colorful. The weather starts to cool down in September when summer is slowly turning into autumn. At the beginning of this season, the average temperatures start at 16°C (61°F), cooling down to 5,5°C (42°F) in October, and getting to -1°C (30°F) in November with the approach of winter. Main events in fall include music festival The Dvořák Prague in September, Halloween in October, and St. Martin’s Day in November. Prague gets quite cold during winter, but you need to be a bit lucky to find it covered in pure white snow since the average precipitation is at its lowest during the winter months. The temperatures are usually between 2°C (36°F) and -2°C (28°F) in December. It gets colder in January when the temperatures sometimes drop even to -10°C (14°F), and the weather is quite similar in February. Major events in Winter include the Christmas Markets, Saint Nicholas Day, and New Year’s Celebrations in December, and Valentine’s Day in February. I am worried about thunderstorms in August. Are they predicting lots of rain this August? After spending time on the Danube we ate Going to spend a few days in Prague. Last weekpant. When it’s rainy make yourself comfortable in some of the greatest cafes and bistro. See Prague’s Cosiest Bars, Cafes and Pubs or 10 Coolest Hipster Hotspots in Prague. Hope you will have a great time in Prague!